You probably already know that you want an intercooler with maximum cooling and minimum restriction, but we think it’s important to understand why. As air is pressurized by your turbo, it heats up because compressed atoms in the air are forced closer together, move faster, and have more energy. That energy manifests itself as heat. Removing heat helps eliminate pre-detonation, allowing for increased output from your system. Your OEM TMIC does just fine at stock boost under normal use, but as soon as you start putting some real heat into it with higher boost or harder use, it heat-soaks beyond recovery. Each intercooler uses two unique end tanks. The first accepts the hot charge air from the turbo and feeds it to the intercooler core. The second receives the cooled charge air from the core and delivers it to the throttle body. These end tanks are precision cast and machined right here in Minnesota. The bypass valve flange is milled flat and stainless steel studs are permanently installed to ensure that the aluminum threads don’t become damaged and shorten the life of the intercooler. Following inspection, end tanks are welded to high density bar and plate intercoolers before the entire assembly is pressure tested, cleaned and sealed for shipment. 5-ply silicone couplers hold their shape in extreme conditions and ensure that charge air makes it to and from the intercooler with no trouble. Splitters are laser cut from aluminum sheet and CNC bent before being assembled and powdercoated with a durable texture black finish. Stainless steel hardware secures the splitter to the factory hood scoop. We setup testing to simulate a real world scenario that’s typically demanding of an intercooler. The test vehicle is a 2012 WRX with a GrimmSpeed downpipe, boost control solenoid, prototype intake and professional tuning. On a closed course, we accelerated in 3rd gear from 3000rpm to redline repeatedly, with 5-8sec between runs. Temperature was logged via k-type thermocouples between the turbo and the intercooler and between the intercooler and the throttle body on both units. Ambient temperature here in Minnesota for both tests was between 20 and 22 degrees F.
The results above speak for themselves, but here’s a breakdown. The phase differences between the runs are a result of how quickly we could safely get the car back down to speed for another run, but the important thing to notice is the magnitude of the temperature fluctuations. Predictably, both intercoolers were seeing similar Pre-IC temperatures on each run (180-190F peak), but while the GrimmSpeed Uncoated TMIC kept Post-IC temperatures between 30-40F the entire time, the OEM TMIC fluctuated between 35-75F. This is the kind of consistent cooling that you should expect from a high quality TMIC and is a function of the geometry and design of the bar and plate core. Our high density core has a massive heat transfer surface area but maintains a large enough cross-sectional flow area that there’s very little added restriction. 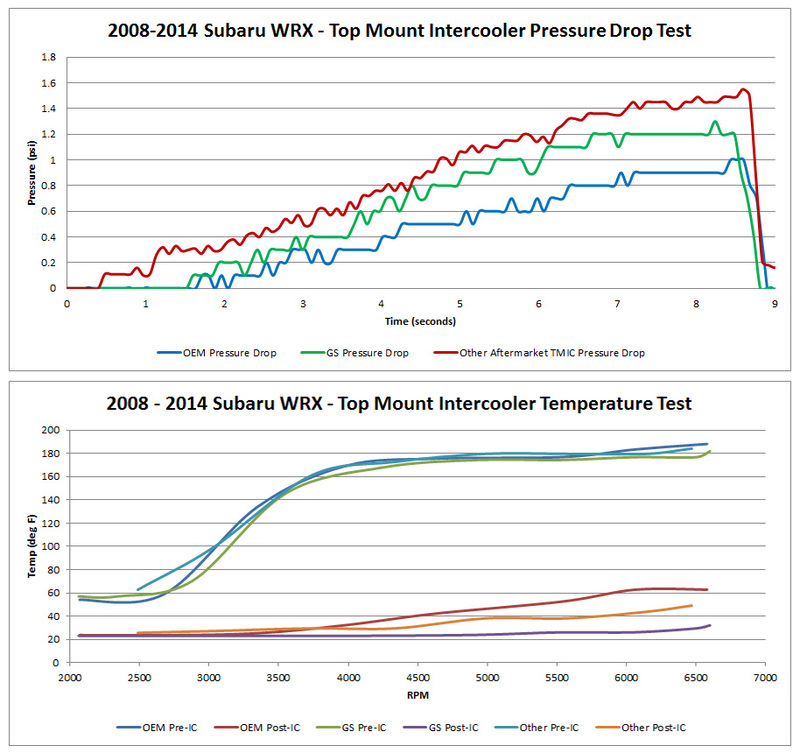 The charts above represent average pressure drop and temperature drop for each of the three intercoolers that we tested. It's interesting to see that each intercooler has it's stronger and weaker points, which is to be expected. Intercooler design is all about finding the right balance of heat transfer and pressure drop. As you can see here, we've opted for a large heat transfer with a small increase in pressure drop. The stock TMIC creates a smaller pressure drop, but sacrifices greatly in heat transfer. The 'other' TMIC that we tested offered heat transfer between OEM and GS, but had the highest pressure drop of the three.